After finding people to serve on your Advisory Board, sending out invitation letters, and selecting the board members, it's time to start planning the first Advisory Board meeting. The key to getting your Advisory Board off to the right start is to start as you mean to go on. You've already given a great deal of thought to what you hope to gain from having an Advisory Board and looking forward to the advice and expertise that your Advisory Board members can provide in various aspects of your business such as management, marketing, accounting, staffing, customer service, technology, etc. So you want to be sure that right at this first meeting you let your Advisory Board members contribute. Your first meeting, therefore, like all your Advisory Board meetings, needs to be planned around a question or problem. You might find it easiest to ​state the problem as a goal. For instance, "We want to increase our sales by 25% this next quarter. How might we do this?" Or you might state the topic for discussion more generally: "How can we cut our business costs?" or "How can we increase productivity or how can we improve customer service?" Once you've decided on the discussion topic, it's time to gather the materials that your Advisory Board members will need. Because this is the first Advisory Board meeting, you should include a business plan and any other documents pertinent to the discussion topic, such as charts, graphs and fact sheets illustrating the background of the discussion topic. If possible, you should send a copy of these documents to all Advisory Board members two weeks in advance, along with a copy of the agenda. Below is an example of a first meeting agenda (with comments for running the meeting efficiently) that you might want to use for your first Advisory Board meeting. Notice that each agenda item is timed; building a time schedule into your meeting and sticking to it ensures that your meeting doesn't get bogged down and stimulates on-topic discussion. You will also want to make some arrangements for recording the minutes of the meeting. Don't try to do this yourself; you need to be able to participate fully by listening and contributing. If you don't have someone who can attend and serve as a secretary, ask permission of your Advisory Board members to record the meeting. Having refreshments available is a good idea. Coffee, tea, water, juices and healthy snacks such as fruit or muffins are a nice touch and always welcome at meetings. After your first meeting, you will have a sense of attendees' preferences for beverages and snacks and can plan accordingly for the next meeting. Above all, don't fret about your presentation. You are there to share your vision and hopes for your company and seek advice, not to impress anyone with multimedia presentation effects. 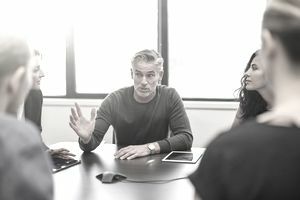 Your long-range goal is to establish a working relationship of trust with your Advisory Board members, so focus instead on ensuring that your Advisory Board members walk away feeling that they've been heard and that they've contributed to the management of your company - and looking forward to the next meeting of the Board. The sample advisory board meeting agenda below includes suggested activities with notes to guide you through the meeting process. Print out this agenda and adapt it to your needs. You can copy it directly into a Word, Excel, or similar office document by selecting the text and using copy/paste. 10:05 - 10:10 a.m. Why an Advisory Board? If you use this time schedule, this is a great time to take your Advisory Board members out to a good lunch (especially if snacks have not been served during the meeting). Remember that the meeting is over and the lunch should be primarily a social occasion! You should never have an Advisory Board meeting that runs longer than two hours. Two hours is long enough for most people to give their undivided attention to the task at hand. In future meetings, you should start with a review of what you've done about the topic that was discussed in the last meeting, and invite your Advisory Board members' comments about your company's actions. Because the "meet and greet" is out of the way, you may want to have two discussion topics at future meetings of your Advisory Board. You may even have three if you think they'll fit comfortably into the two-hour format. But you should never have more than three.